The Lady Bulldog basketball team finally got a significant monkey off their backs Friday with a 41-30 road win over Santa Teresa that snapped an eight-game losing streak. Unfortunately, a war of attrition from the field Saturday at home against Albuquerque Academy ultimately resulted in a 34-23 loss to prevent the weekend sweep. But with four days off prior to their final regular season double headers, the girls in orange will be looking to cure the shooting woes that have been doing them in of late. “We’d beaten Santa Teresa already a couple of times, so I felt like we were a little more confident going into that one,” head coach Jeff Houghtaling said of Friday’s bout. “I think one of the biggest things that helped us was that we were able to come out and hit some shots early. The game was a low-scoring affair on both sides, but the Lady ‘Dogs were able to use solid defensive pressure to hold the Lady Desert Warriors at bay throughout. “Our full-court pressure generated some good offense for us,” Houghtaling said. “We were ahead by 20 at one point before they whittled it down a little at the end, but it was a good game, and I was really proud of the way the girls played. Through one half Saturday at Bulldog Pit, Artesia was in position to earn another one over a Class 5A opponent. Down by just four, 18-14, to Academy at the break despite hitting just four field goals in the opening quarters, the Lady Bulldogs would go silent in the third quarter, and that proved to be the difference. “I really feel like we played as well as Academy did, we just didn’t shoot very well,” said Houghtaling. “When I went back and looked at some of the charts after the game, turnovers didn’t hurt us, and defensively, we did some really good things. We just struggled on the offensive end, missed a bunch of easy shots inside, and every time it seemed like we had a good open look, it just rimmed out. After outscoring Artesia 8-0 in the third to build a 12-point lead, Academy was able to force the Lady Bulldogs out of their zone defense and see more production in the paint in the fourth. Down 34-18 with just over two minutes to go in the game, Alissa Wagner hit her second three-pointer of the day and Alexa Riggs added five points to prevent a total drought from the field in the second half, but the Chargers held on for the double-digit win, 34-23. 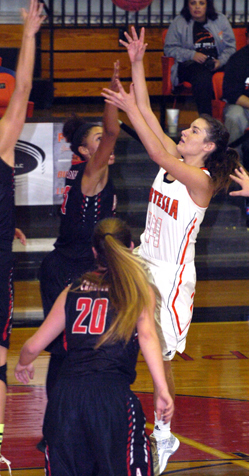 Wagner finished with eight points to lead Artesia, followed by Riggs and Kyrah Gonzales with five each. Academy’s Sophie Long led all scorers with 17. The Lady Bulldogs (5-12) will now have a break before heading to Carlsbad Friday for their third meeting of the season with the Class 6A Cavegirls. Following that outing, it’ll be back to Bulldog Pit Saturday for their regular-season finale against Ruidoso. “It’s been a while since we had a four-day stretch where we could just slow down and work on some stuff,” said Houghtaling. “We’re certainly going to shoot a bunch this week just with the idea that maybe we can find something to turn that switch on and get us scoring a little better.